Mackinac Island Treasure Hunt is illustrated by Traverse City Artist Glenn Wolff. Listen to the audio story. Getting around Northern Michigan's hottest tourist destination has become a strategy for board game enthusiasts. 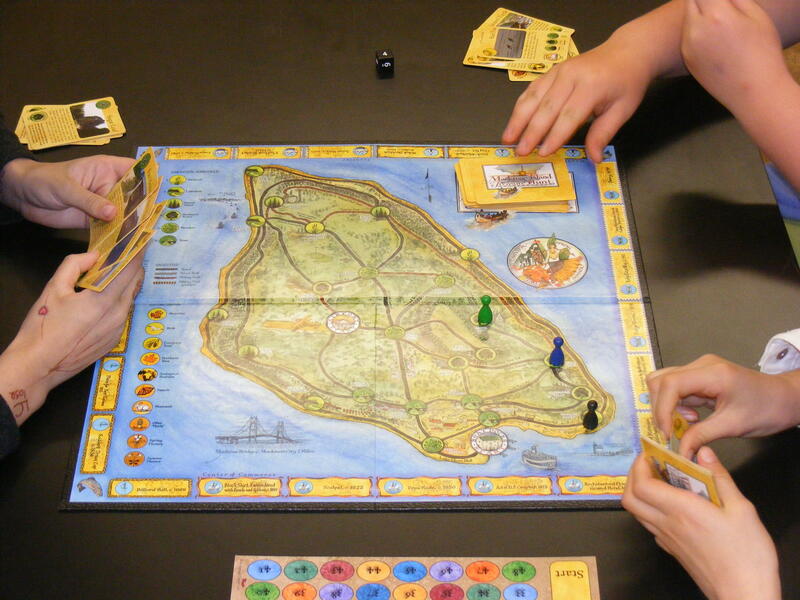 Mackinac Island Treasure Hunt is not in stores yet, but IPR followed along one day as students at The Greenspire School had a chance to play it. In the game, players collect photo cards about sites like Fort Mackinac. Cards also represent the island's native plant life, such as lady slipper, and local animals like the red fox. The detailed illustrations of the box and board are the work of Glenn Wolff. The Traverse City artist has illustrated several New York Times articles and painted murals that hang at the State Theatre. He's known for his layered, detailed and moody work. Students at The Greenspire School test out the new board game, which is not yet on store shelves. "When I'm working in pen and ink as an illustrator, I do that same thing," Wolff says. "Only I'm always thinking about how it's going to reproduce. So I'm trying to be as clean as possible and get a lot of information in those layers." But doing a game board was something new to Wolff. "It seemed great to me, because I started thinking about those Christmas mornings when I'd open a package and there'd be a game like Monopoly or Operation or Sorry and how much fun that was," he says. The game's creators have similar fond memories, says Barbara Overdier. 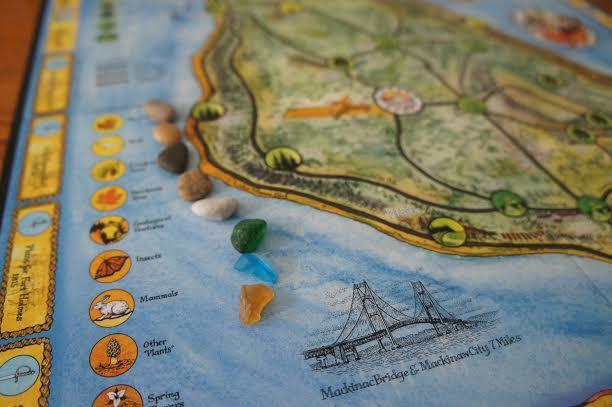 She and her husband Jim Muratzki figured the island was a natural fit for a game board. "We go out to the island every spring," says Overdier. "Just thought maybe it would be fun for people, educational for even people who can't get to the island." The couple is currently conducting an on-line crowd-funding campaign to manufacture the game in Battle Creek. They hope to have the game on store shelves by later this year. Arnold Ferry Line is up and running. The company started running passenger boats to Mackinac Island Friday, along with the other two ferry services to the island, Shepler’s and Star Line. The fate of Arnold Line came into question in March when a barricade briefly appeared in front of its main dock. Arnold has had financial difficulties recently and sold that piece of property to hotel developers. So far, it has not worked out a deal with the new owners to allow ferry passengers and horses to cross from the dock to Main Street. The view of Mackinac Island’s oldest ferry terminal has been protected. Island officials worked out a compromise this week with a developer who wanted to build a new hotel in front of the Arnold Transit dock. It looks like a victory for supporters of new historic protections on Mackinac Island.